Here is another record from the Philippines, one that is much earlier and way different musically than "Anak" by Freddie Aguilar. This one is by Ruben Tagalog, a movie star and singer. He started his career as an entertainer in 1934 at the age of twelve when he and his two sisters set down in Manila as the Wanderers Trio. 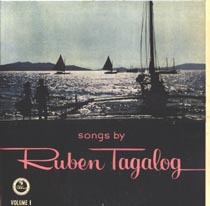 Occupation of the Philippines by the Japanese during World War II broke up the group, but Ruben kept singing, building a fine career making records and movies. One of Ruben's groups is called the Mabuhay Singers, which might be a name familiar to those of you who scour thrift stores. Mabuhay Singers records surface from time to time and they are always cheap. Most record fiends have bought at least one, only to be disappointed. I've been burned on enough of them (and other Filipino records) that I swore off anything that originated from those islands (something I am reconsidering since scoring the Aguilar and then this). Aside from the language, there is nothing remotely Filipino about this Ruben Tagalog record. It sounds like a very nice lounge record with a very nice baritone and a hint of exotica. It has a sound that is dated enough to be romantic. Close your eyes and imagine people dancing to this and then realize that they'd be dead by now. It is really music from a different world. A couple posts ago reflecting on not knowing who Lepa Brena - a Serbian singer who has sold more than 40 million albums - was and that the world is really much bigger than we think it is. Well, here's one more example of that. Freddie Aguilar is not only the pop musician of the Philippines but his importance crosses from culture to politics and into the history books. Musically, Aguilar's importance centers on two things. First is he wrote and performed a song called "Anak" (which is the title cut of this record and which you can hear/watch). "Anak" sold millions of copies when it was released. It not only lodged itself in the Philippine charts at number one, it topped the charts in Japan, Indonesia, Malaysia, and other countries in Southeast Asia. There are over 100 versions of it recorded, in 23 languages. 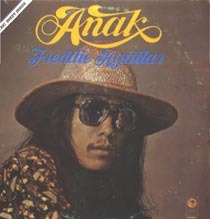 Number two: Prior to "Anak"'s success, Aguilar was one of many artists associated with Pinoy Rock, the Filipino version of rock & roll, which started in the 1960s but really took off in the Seventies. Pinoy Rock was to serve as part of the cultural roots of opposition to the dictatorship of Ferdinand Marcos. Politically, Aguilar is important because he is one of the artists who headed up opposition to Marcos. His recording of the protest song "Bayan Ko" (with additional lyrics criticizing Marcos) became the anthem of the "People Power" movement, which lead to the peaceful revolution which toppled Marcos. Aguilar was harassed by Marco's henchmen but stood as a cultural icon against the dictatorship, while giving public support to opposition leaders. Now I didn't know any of that before I found this record, even though I have a goddamn book on Pinoy Rock (Punks, Poets, and Poseurs), a book that I've read a couple times. And though the book focuses mostly on the Pinoy scene from the mid-Eighties to the Nineties, Aguilar is mentioned. Duh. As I've written before, all of this is a nice history lesson, but that is all it is if the music doesn't deliver. Aguilar does. While "Anak" is a nice song, it is the rest of the album which I dig the most. Aguilar's best stuff is quiet, moody, and mildly psychedelic. It has the feel of Danny Kirwan-era Fleewood Mac mixed with a bit of Leonard Cohen (music not vocals). When Aguilar "rocks," it is a laid back sound, something that is a bit like a bluesy Sir Douglas Quintet. It's really nice stuff.